Phra Chomklao Chaoyuhua (His Majesty King Mongkut), born on 18 October 1804, was the fourth monarch (Rama IV) of Chakri Dynasty, the great grandfather of the present king, His Majesty King Bhumibol Adulyadej (Rama IX), and a son of King Rama II whose name will always be remembered not only as a great scholar and artist but also one of Thailand's greatest poets. King Mongkut's education in the early years followed the course laid down by savants over the centuries for those born to rule. His studies included Thai, Pali and Sanscrit, literature, poetry, history and wars, and the ancient art of war including the use of weapons and the riding of elephants and horses, as well as Buddhism and the Code of Morality of Kings. After the formal tonsure ceremony in full style as a prince of the highest rank when he was thirteen, which marked the end of his childhood, King Rama II took charge of his son's education. To the influence of his royal father, King Mongkut owed that purity of language and richness in style that made his writings so beautiful and effective. In conformity with the traditional practice of the royal family, he spent seven months in the monastery as a Buddhist novice at the age of fourteen. Then in accordance with Thai custom, when he was twenty he entered the monastery as a monk in 1824. Two weeks later, His Majesty King Rama II passed away with no formal provision made for succession. This being the case, the selection of a successor devolved upon the Assembly of the Princes, Ministers, and high priests of the Buddhist Holy Order. Borne by Queen Srisuriyendra, Prince Mongkut grew up with all the honours associated with the heir apparent. However, Prince Mongkut's 37-year-old elder half-brother born of a mother not of royal blood was chosen on account of his considerable experiences in a number of important posts during the reigns of his father. On hearing of his elder brother's accession, he signified his intention of remaining permanently in the priesthood. From the point of view of Buddhism, events had taken a very happy turn. The monastic life suited Prince Mongkut so well for his extraordinary achievements during the whole reign of his half-brother King Rama III, a period of 27 years. To this day, the impact and impression made on the Sangha or the Buddhist Holy Order by Prince Mongkut as a monk is everywhere apparent. 1. Scholarly works on the Pali Text of Tripitaka and the establishment and operation of the School of Pali Studies. “The prodigy of learning” was credited by one of his biographers to King Mongkut with reference to his exceptional intellectual power and talent for acquiring knowledge. During the early years of his education in the palace, he learned Pali and Sanscrit among other studies; but evidently his unquestionable expertise in Pali and his immense knowledge of the Pali Canon were achieved by his intensive study during the priesthood. Pali is an ancient and the original language of Buddhist scriptures and liturgies. For this reason, Prince Mongkut believed that true understanding of Buddha's teachings could be attained only by mastering Pali. Soon after his ordination, he acquired a thorough knowledge of the language, as demonstrated by his brilliant success in the state examinations, and in a short time was given a high rank and appointed head of the Board of the Pali Examinations. Later the princely temple abbot made Wat Borwonniwet the pre-eminent Pali school in the country, with its reformed system and method of teaching as well as by making it more accessible to talented student-monks. As a teacher of considerable renown, Prince Mongkut's exceptional Pali scholarship was an object of country-wide veneration. He pruned the scriptures and composed Pali verses on many subjects for chanting to be used in various ceremonies, including the morning and evening chanting together with Pali verses for chanting to be used in accordance with strict monastic practice. For the reason that the voluminous scriptures had been until then written in Khmer-based script, Prince Mongkut invented a new script, called the Ariyaka script, to write Pali. My mind does not suffer. Exactly at 9 p.m. on that day, also the day of his birth, His Majesty King Mongkut passed away, after having called for his chamber pot and passed water, then turned his face to the east saying “I am about to die this very moment” and then turned his face to the west saying “I am dying now”, and in this position he remained while repeating audibly, with each shorter breath in softer voice, the sacred name of the Exalted One in the sacred language, Pali. 2. His achievement in restoring Buddhism to its original purity through rational interpretation of scriptures. Soon after his ordination, the princely Buddhist scholar discovered that scholarship in one of the leading monasteries of the kingdom was lacking and even senior monks were so ignorant that they could make no clear distinction between the teachings of Buddha on the one hand and the accretions from animism and Hinduism on the other. Prince Mongkut was well aware that the Buddha's teachings were first recorded in writing four centuries after his death and that during that period, his disciples had endeavoured faithfully to preserve his teachings and to pass them on from generation to generation by word of mouth, but errors and interpretations had inevitably crept into the original body of teachings. In addition, errors made by laborious manual copying of the voluminous scriptures in the two thousand years since then had caused further confusion. Prince Mongkut felt that the true teachings of Buddha could be sifted from the distortions and accretions of twenty-four centuries only by studying the scriptures critically, not in the spirit of faith but in the light of reason. In his intellectual and critical approach, Prince Mongkut used the criterion of rationalism taken from Buddha's famous dictum to his followers not to believe in his teachings merely because they had faith in Him but they must test every belief with their own powers of reason. Prince Mongkut made judicious selections and rejections of Buddhist scriptures, through eliminating accretions and emphasizing the meaning of the scriptures and the purpose of each precept. Buddhist scholars consider Prince Mongkut's endeavour as an achievement in restoring Buddhism to its original purity. A western scholar and biographer of King Mongkut regarded it as a “new Buddhism' purer than any other extant form of Buddhism. Prince Mongkut did not stop with this purely intellectual approach. He wanted the pure doctrine and the moral principles in which he believed to be understood by the monks as well as by the people. He began to teach and taught his followers to preach. He wanted others to understand the usefulness of the practices which the Buddha had initiated and the purpose that they carried. His teachings aimed not only at eliminating patent abuses in the church but also at focusing Buddhist thinking on morality, purging it of superstitions and other accretions to the pure doctrine. His teachings brought about the great reform in the Buddhist church and a renaissance of religion in Thailand. 3. Instituting the new Buddhist Thammayut Sect. From the status of the royal prince of the highest rank and heir apparent, living a life in luxury and riches, Prince Mongkut chose to become a monk sworn to poverty, a life of celibacy and rigorous discipline of Buddhist priesthood, bound up in learning to subduing self instead of conquering and ruling others. It is certainly hard for any man to conceive and accept such a great change in life, but not for Prince Mongkut to leave a most privileged life of a royal court with its autocratic principles in order to enter one of the world's most democratic institutions, the Buddhist priesthood. On entering the priesthood, titles, ranks, privileges, all being renounced, Prince Mongkut now known as Makuto Bikkhu (Mongkut the Beggar) was one among other members of the brotherhood, all being equal and sharing common poverty. In the Sacred Order, superior knowledge and only years of good conduct, governed by two hundred and twenty-seven rules, could bring seniority and precedence. From the beginning of priesthood, the conscientious Makhuto Bikkhu strictly adhered to the monastic rules of conduct. As one of the two hundred and twenty rules, he observed the act of walking the streets barefoot at dawn each day to beg for his daily food and ate whatever was given and placed in his bowl by the householders in exactly the same way as other priests; he fasted strictly from noon until dawn. He completely and faithfully observed all other rules, including absolute chastity, for 27 years of his life. Prince Mongkut, as a monk, had been a model bikkhu, famed for strict adherence to the monastic discipline. Contrariwise, in the two monasteries he took up residence in the early years, it was disappointing to the enthusiastic and pious Makuto Bikkhu to find far too many ‘professional monks', recluses who made a living out of the simple-hearted; far too many monks did not observe the monastic discipline; and scholarship was at a low ebb. He believed that by strict discipline, by cultivating restraint, compassion and wisdom, and by regular practice of the various means of mind control, one can so subdue the ego as to reach a state of equanimity in which one becomes increasingly impervious to all forms of suffering. The princely monk realised how far from the ancient disciplines his brothers in the religious order had drifted and how much of the practices followed was done mechanically with no understanding of their inner meaning and purpose. To him, it was a sacrilege to wear the yellow robe and to accept the prerogative of the status and the homage due the Sacred Order if one did not truly follow the authentic teachings of Buddha. He proceeded to institute the reform of the monastic discipline and practices, as well as the ordination ritual. By then some thirty disciple-monks came to him to be re-ordained in conformity with the stricter ritual instructions, thereby forming the original core of what would later be a new Buddhist order under his patronage. Then as the Abbot of Bowonnivet Temple, with his fame as a scholar and already as a teacher revered for his strict adherence to the monastic discipline, the scholar-monk Mongkut attracted many monks of high calibre to his monastery from places far and wide. Starting in 1837 with five resident monks, the number soon grew to more than one hundred. Also many young men went there to be ordained, even if they intended to take up residence in some other monastery after the ceremony had been performed. Thus a new Buddhist sect was born, known as Thammayut Sect (the Order adhering to the teachings of the Buddha). The essence of the Thammayut Sect was stricter adherence to the precepts of Buddhism as laid down by the Buddha. All practices that were not based on reason or on original Buddhist practice were eliminated. Monks would not blindly follow rituals and they had to learn the meaning of their Pali chants. It encouraged rationality, orthodoxy, and austerity in monastic life in exactly the same way as Makuto Bikkhu had pursued. Those who belonged to the old established order became known as members of the Mahanikai Sect (the Order of Greater Number). But the old established order, confronted with criticism and dissent for what was lacking, could not remain complacent and resistant to some acceptable changes. Thus the reformation undertaken by Prince-priest Mongkut had also resulted in the healthy overall revival of Buddhism in Thailand. 4. The Pursuit of freedom of religion for all. Deep-seated in Buddhist philosophy and through the long years of life with rigorous monastic self discipline, King Mongkut believed that every one is and must be responsible for making one's own decision and responsible for one's own action; merit or demerit were judged by the result of one's own deeds. He upheld the principle that one should be free to accept any belief of one's own choice with one's own powers of reason. It was his view that, as no one could be certain of what would happen in the next life, everyone should have complete freedom to prepare for it in the manner that seemed best to him. The principle that everyone be given the freedom of conscience and religion was King Mongkut's belief during his priesthood; this was also affirmed as his policy during his reign. As much as he was fervent in his own belief, King Mongkut had never let his own convictions interfere with his liberalism. His respect for the conscience and beliefs of others was exemplified by the fact that when he became King, he never showed signs of preference or favouritism towards the religious sect which he himself had founded during his priesthood, but kept himself in strict and resolute impartiality towards both sects throughout his reign. True to the Buddhist esteem for the virtue of tolerance, King Mongkut, whether as priest or King, had never shown any prejudice towards alien religions nor ever put any obstacle in the way of missionaries; indeed he even gave them opportunities and help. At Bowonniwet monastery while he was the Abbot, King Mongkut allowed a missionary friend to use a room to preach Christianity and monks to attend. Then and later, he gave them whatever facilities they asked for and saw no objection to his subjects worshiping the Christian God if they so desired. The Christian belief in the existence of the creator-god ran counter to the doctrine of Buddhism in which King Mongkut had unswerving faith, and, to the great discontent of the missionaries, he showed not the slightest disposition to accept the tenets of Christianity. But he recognised their own profound convictions. King Mongkut chose to use the term “Superagency of the Universe” as a convenient means of overcoming the difficulty caused by the clash between Christian and Islamic theistic doctrines and Buddhism's disbelief in the existence of a supreme deity. This difficulty arose when he was corresponding with people such as the Pope and Queen Victoria. He could not conscientiously ask God to bless them or acknowledged God's blessings to himself, so he made use of a term which could conveniently be made to apply to any religion. King Mongkut's remarkable tolerance of different religions was not without precedent in Thailand. It had always been, as it is still now, held that a Buddhist monarch had the duty of protecting and supporting all religions, and many of his predecessors had donated land and building materials for the construction of mosques and churches. King Mongkut, however, did go further than his predecessors in his magnanimity towards Christian missionaries, and it was this which made him bear, with equanimity, their vehement attacks on polygamy in association with Buddhism. King Mongkut practised his religious toleration to the extent that may seem quite extraordinarily liberal, especially as the missionaries, some of whom he became friendly with, never relinquished their audacious and increasingly tiresome attempts to convert him without success during his priesthood and as king, or their published criticisms of “the pernicious system of polygamy”. It was all the more so as they were inclined to speak contemptuously of Buddhism, which seemed a poor return for the Buddhist monarch's magnanimity shown to them. The persistent endeavours to convert King Mongkut to Christianity had been made in the expectation that his conversion would be followed by the wholesale conversion of his subjects. This had not happened and, to his credit, did not cause the King's resentment either; nor did it affect his friendly attitudes towards the missionaries. In the course of time, they felt bound to admit that “Siam had the mildest and best heathen government on the face of the globe”. 5. King Mongkut's contributions to archaeology and history. During the twenty-seven years of his priesthood, in the dry seasons when he was not in retreat, the scholar-monk made pilgrimages throughout the countries, combining his spiritual missions with his archaeological interest. His pilgrimage in the summer of 1831 led him to the ruins of an ancient pagoda of enormous size swallowed up by jungle growth. The area in which this monument was found, now known as Nakhon Phathom, turned out to be the most important early centre of Dvaravdi civilisation, which came to light when King Mongkut had the ancient pagoda rescued from the jungle in 1860. At that time it would never have occurred to anyone to use that particular term to designate the cultural features and art style of the Mon kingdom, which is the cultural period during the second half of the first millennium of the Christian era preceding the Khmer culture. During the work of clearing the site for renovating the ruined pagoda, a large number of ancient images and other objects were discovered, which provided the earliest evidences of Buddhism in Thailand. Among them were several stone “Wheels of the Law”, tablets bearing the well-known Buddhist Credo, carved altars, Buddha's footprints, all of which were symbolic objects of worship in ancient India in the period preceding the making of images of the Buddha within the first century and a half of the Christian era. Several unique statues of the Buddha, bas-reliefs representing scenes from his life and miscellaneous statuary as well as two large stone fragments of architecture, both also inscribed with the Pali Ye dhamma formula were also discovered there at the same time. As the ruined pagoda was found to have been restored several times earlier until its original shape was completely changed, King Mongkut decided to leave the original pagoda standing as it was, being unwilling to demolish so venerable a relic. Instead he built a new enormous pagoda covering it over to mark the exact spot with a monument which can be seen all around from a far distance. At the same time he built a replica of the old pagoda nearby that can be seen in the outer courtyard. The design of the layout for the pagoda was superb. Four chapels were built for housing four images of Buddha in different attitudes at the four cardinal points with a wide circular gallery connecting them. The design of the plan incorporated a great many other things, such as placing of numerous statues of Buddha throughout the landscaped grounds, planting of trees connected with the life of Buddha, even road construction and canal digging. King Mongkut did not live to see the completion of his work which was carried on by His son King Chulalongkorn according to instructions. The pagoda itself has become the country's most important sanctuary to the extent that a royal tradition has been established for the reigning king, whenever on his way somewhere passing nearby the pagoda, to stop and pay homage by offering candles and joss sticks. “The elegant spire of Phra Phathom Chedi, an ornate pagoda housing sacred relics rises more than 127 (417 ft) to pierce the blue sky of Nakhon Phathom, one of Thailand's most ancient cities. 5.2 Archaeological treasures and history of Sukhothai Kingdom. Before King Mongkut's time, the world knew little beyond a body of miraculous legends about Sukhothai, the first independent Thai Kingdom that dominated over the greater part of what is now Thailand. If there had been a written history of it, this had not been preserved, or had been destroyed, as archives, books and documents were destroyed when the Burmese army captured and burned the whole city in 1767. But many accounts connected with Sukhothai can be gleaned from the histories of Burma and of Chiengmai. King Mongkut was the first person in modern times to make contributions of great significance to the history of Sukhothai, for which historians stand most deeply in their debt. In 1833, the scholar-monk Mongkut set out on a long and momentous pilgrimage to a region well to the north, the results of which were to be of everlasting value to historians. The journey took him to the ancient capital of Sukhothai, the cradle of Thai civilisation. After two days of examining the ruins, he discovered two archaeological objects, a square stone stele with inscribed surfaces and a piece of large slab of stone carved on its edge with designs in bas-relief, both lying in the vicinity of a ruined edifice. One of them, the inscribed stele, turned out to be the earliest known written record about Sukhothai inscribed in the ancient Thai script, an invention in 1283 A.D. by King Ramkhamhaeng, the third king of Phraruang's dynasty of Sukhothai. The celebrated stone inscription was the work, in 1292 A.D., attributed to King Ramkhamhaeng himself. It is immaterial regarding the contention whether only the first portion comprising 18 lines of the anecdotes of the inscription was written or caused to be written by King Ramkhamhaeng himself, whereas the rest, from the 19th line to the end of inscription on 124th line, was done at a later after the his reign. The stone inscription is most valuable for its information about the king and his royal family as well as its description of the picture of Sukhothai kingdom and its contemporary life. No less significant is its description of the rights of citizens and the duties of the Thai King towards his subjects. King Mongkut, after his succession to the throne, adopted this ancient Thai principle of kingship as set out by King Ramkhamhaeng. The distinguished British scholar Dr Reginald le May referred to this stone inscription as “the Magna Charta of Siam”. No more Sukhothai inscriptions were found during King Mongkut's lifetime, but several more were found during the reign of King Rama V and the search has been continuing. The interest King Mongkut aroused in the study of Sukhothai's past has grown steadily with the years, continuing to the present day. From this same stone inscription, Prince Mongkut found out that the stone slab lying nearby the stone pillar, which he had also brought back to his monastery, was the stone seat upon which King Ramkhamhaeng used to sit while dispensing justice to his people. This so-called the ‘Seat of Justice' is regarded one of the country's greatest treasures, having become the Coronation stone, upon which the King of Thailand is seated during the Coronation ceremony. Ayuthaya, the name of the second capital city, for 417 years, of Thailand, was taken to signify the Kingdom as well. This in the political and societal context of the historical period denotes the supremacy and pre-eminence of the capital city in relation to other cities and towns in almost all facets of life. Unfortunately, this trend of gravitation towards to the centre had caused the centralisation of archives, official and historical records, literary works and other valuable documents, almost all kept in the capital. When Ayuthaya was sacked and burned by the Burmese in 1767, the loss to history was irreplaceable. King Mongkut's grandfather, Rama I, while undertaking the urgent tasks of construction and reconstruction, took time off to turn to the history of the past in recognition of the essential role of history in rebuilding the nation which had so lately lain prostrate. King Rama I gathered from different provincial centres copies of different portions of the Annals of Ayuthaya, had them collated, made corrections and additions of his own, and had the final version in manuscript form in 1785. There were other works in Pali which threw some light on the history of the country, of these he had translations made. He had a new Code of Laws compiled and did many other things to encourage and revive literature, arts, and culture, as well as Buddhist studies. It fell upon King Mongkut to make his contributions to his grandfather's version of the Annals of Ayuthaya in the light of more manuscripts of portions of the annals which were discovered in the later years after the death of King Rama I. The new materials which King Mongkut found to be authentic differed in some details from the materials available during the time of his grandfather. King Mongkut made use of the new materials to reconcile the discrepancies in his sources and made a number of amendments in order to get nearer the truth. His amendments were intelligently made on the basis of the sources at his disposal at that time. King Mongkut's new edition of the Annals of Ayuthaya was known as the Royal Autograph Edition of the Annals. 5.4 The ruins of Angkor. King Mongkut had an enduring interest in archaeological ruins of ancient monuments. After his succession to the throne in 1851, King Mongkut would naturally know a good deal more about the ruins of Angkor by reports he received from the Thai officials who were administering the province where Angkor was located. His great interest in Angkor reached the extent that King Mongkut during his reign built a replica of Angkor Wat in the precinct of the Royal Chapel inside the Grand Palace. The fact that the replica is a remarkably faithful copy is of no small significance. King Mongkut, even with his knowledge of the site, would still need to have at his disposal accurate plans and details. All this was done and achieved by King Mongkut at a time when the few notices that reached Europe received scant attention. King Mongkut knew a good deal about the recent history of Cambodia, particularly its relations with Ayuthaya from sources such as the Annals of Ayuthaya. Naturally as a historian he would have liked to know more about ancient Cambodia, but in King Mongkut's time, the ancient history of Cambodia was as obscure and fabulous as that of Thailand. He knew that researches on the ruins of Angkor would lead to our knowledge of the ancient history of Cambodia. Therefore it was in his interest to provide assistance and support to get the studies started in any way he could. In 1854, Pallegoix gave a short notice of the ruins in his Description du royaume Thai ou Siam. Pallegoix was the French prelate whose parish was close by the monastery of the scholar-monk Mongkut during the early years. They became friends and the two scholars embarked upon an exchange of knowledge for many years. Since Pallegoix had not seen the ruins himself, it was understood that he got the information about the ruins from King Mongkut. In 1860, the French naturalist Henri Mouhot, with King Mongkut's aid and encouragement, visited Angkor. His written account of the ruins two years after his death was enthusiastically received. In 1863 Adolf Bastian, who visited Angkor again with the assistance from King Mongkut, wrote the first scientific paper and also made attempts to decipher the inscriptions he saw in Angkor. By the tenets of Buddhism that nothing was static, King Mongkut fully realised that to be with the times one must change with the times, and that to stand still simply meant disintegration. Relinquishing the idea that Siam was a mighty Kingdom and the King of Siam the master of it, he openly admitted that his country was backward in many ways and that there was plenty of room for improvement. He realised that Thai people had to be better educated in modern sciences and technology, and his country had to learn from the West. King Mongkut assiduously pursued this, beginning with himself since the early days in the priesthood in his association with both the Catholic and Protestant missionaries. He learned his first lessons in Latin and English from the French prelate Bishop Pallegoix, and in return the prince-monk gave the Bishop lessons in Pali and Thai. Through the friendly intellectual dialogs, the prince-priest heard of other lands and peoples far beyond the seas, of their ways of life, and of other creeds and religions. When it became known that the Prince was ready to make friends with foreigners, other westerners came to see him, including the American missionaries who pushed before them Presbyterianism. But following their religious trail the American missionaries brought along schools and learning, medicines and hospitals, and printing presses, all of which Prince Mongkut wanted for his people to realise his idea of modernising the country. As soon as Prince Mongkut became King, he put his idea of modernisation into practice. In order to seek the benefits of modern learning and of education in modern sciences and technology from the West, he adopted the policy of bringing about friendly and closer relations with other nations, especially with those of the western world, in the place of the age-old policy of self-sufficiency and isolation with a view to adapting Thailand's own institutions to theirs. Nevertheless, being fully aware of the potential threats posed by France and England, King Mongkut tried at all times to maintain an equitable balance in his dealing with them, and at the same time cultivated friends with world celebrities such as Pope Pius IX and several Presidents of the United States as well as Queen Victoria so that their favour and friendship would help ensuring the balance between the two colonial powers. King Mongkut made use of his own experience during twenty-seven years of priesthood that with his interest in the scientific knowledge of the west and in its mechanical application and through his willingness to study, with English as a tool, he had gained immense knowledge of the modern world and an insight and understanding of the West. With wisdom and vision, King Mongkut had laid the solid foundations for the introduction of modern science into the country. At the suggestion of Thai scientists, the whole nation has proclaimed King Mongkut the “Father of Sciences”. 7. His achievement in mastering languages, mathematics, and astronomy. During the long years of his priesthood, he took time to learn contemporary Oriental languages, which included Cambodian, Vietnamese, Mon, Burmese, Malay, and Hindi. He was credited for knowing all of them well enough for actual use in his reconstruction of Thai history and in his work on the derivation of usages and words. In addition, he managed to master Latin and English. He was rightfully acclaimed an outstanding linguist. In the later years of his priesthood and continuing on even after his ascension to the throne, King Mongkut studied geography, physics, chemistry, mathematics, and astronomy. He did all of these by himself. Of all the sciences, astronomy appealed most to King Mongkut. He had an observatory built on his palace hill in Petburi. He loved to compute eclipses. His study of astronomy had been so thorough that he was able to calculate the exact moment of the eclipse a long time in advance. While still in the monastery he published his calculations of the eclipses of 1850 for the information of his foreign friends. In 1868, King Mongkut proved his aptitude and ability as an astronomer by predicting a solar eclipse over the Gulf of Thailand with even greater accuracy than the expert astronomers sent out from France to observe it. He had issued proclamations concerning the total eclipse of the sun on 18 August 1868, whose path would cross the Gulf of Thailand with the best point of observation on land at a promontory just north of a long white beach at Sam Roi Yot. Foreign guests invited from overseas included Sir Harry Ord, Governor of Singapore, and a French astronomical mission headed by M. Stephan, Director of the Marseille Observatory. Most unfortunately, Malaria struck many among those who had attended the party, including eight of the ten French scientists. Tragically, His Majesty King Mongkut as well contracted the disease, was taken ill and passed away a few weeks later, on Thursday, 1 October 1868. 8. His practical innovations relevant to UNESCO's fields of competence. The former feudal corvee (forced labour) system was abolished and replaced by paid labour. His decree on equal justice for all before the law, resulting in curbing the privileges of the nobility which had set them above the law. Enactment of laws to improve the status of women and children. The abolition of the age-old tradition of forbidding the common people to look at the King. This needs some clarification. The tradition, derived from ancient India and based on divine kingship, prevailed among monarchies in Southeast Asia. Not only did King Mongkut abolish the taboo; he expressly encouraged the people to view the royal processions and to be available for him to speak to as he wanted. 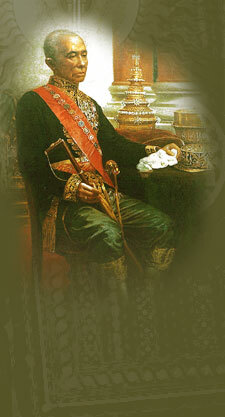 King Mongkut reinstituted the ancient right of Thai citizens of direct petition to the king to redress injustice. The Sukhothai stone inscription which he had discovered while he was still a priest made him aware of this ancient Thai right. King Mongkut considered this right so fundamental to the welfare of his people that on his deathbed he commanded the high officials in attendance that this practice must not again be allowed to lapse. King Prachatipok, Rama VII, his grandson, estimated that during his reign from 1925 to 1935 he personally examined nearly a thousand petitions a year. of the first Thai printing press for publications in Thai and English as well as in the Ariyaka script of his own invention; and the introduction of Royal Gazette for publishing laws, regulations, official notices and announcements.